Make more interesting text by adding some depth to your shadows. Start a new image and add your text. Duplicate the text layer, color it black and rasterize it. 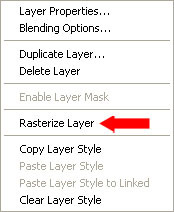 Rasterize the lower layer by right clicking the layer and selecting Rasterize Layer from the pop up menu. With the rasterized layer selected, free transform the layer (Ctrl-T or Edit>Free Transform on the menu). Hold down the control key and select the top-middle deformation handle and drag it up and to the right. Once it is generally the shape you want, let go. Using the Ctrl and Shift key together, adjust the top-right and top-left handles until the perspective you want is achieved. Double click the rasterized shadow text layer and add a gradient overlay. Either adjust the gradient color so its not so dark or adjust the layer opacity to 50% (if on a white background like this). And there you have it, the final version. You may want to try blurring the layer a little, though I like the sharp shadow in this case.